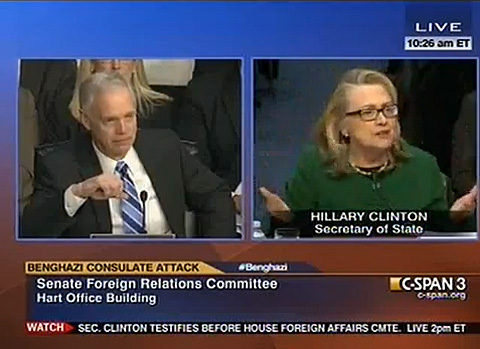 Liberal political commentator, host of "The Alan Colmes Show" on Fox News Radio, publisher of alan.com, author of "Thank the Liberals For Saving America"
The right wing, which has been trying to push a Benghazi "scandal" since before Mitt Romney blew the 2012 election, has concentrated on one phrase Hillary Clinton said during her five-hour congressional testimony. And it's a phrase they are sure to pound into the ground between now and 2016. Hostilely questioned by Wisconsin Senator Ron Johnson, who was desperately trying to nail Secretary Clinton to the wall, the once-and-possible-future presidential candidate was putting events in perspective. As with any developing story, events are fluid, and information comes out slowly, and it was reasonable to believe that protests in reaction to a video sparked the tragedy that led to the deaths of four Americans. Johnson: Thank you, Mr. Chairman and Madam Secretary. I'd like to join my colleagues in thanking you for your service sincerely, and also appreciate the fact that you're here testifying and glad that you're looking in good health. Johnson: Were you fully aware in real time -- and again, I realize how big your job is and everything is erupting in the Middle East at this time -- were you fully aware of these 20 incidents that were reported in the ARB[State Department Accountability Review Board] in real time? Clinton: I was aware of the ones that were brought to my attention. They were part of our ongoing discussion about the deteriorating threat environment in eastern Libya. We certainly were very conscious of them. I was assured by our security professionals that repairs were under way, additional security upgrades had taken place. Johnson: Thank you. Did you see personally the cable on -- I believe it was August 12th -- specifically asking for, basically, reinforcements for the security detail that was going to be evacuating or leaving in August? Did you see that personally? Johnson: OK. When you read the ARB, it strikes me as how certain the people were that the attacks started at 9:40 Benghazi time. When was the first time you spoke to -- or have you ever spoken to -- the returnees, the evacuees? Did you personally speak to those folks? Clinton: I've spoken to one of them, but I waited until after the ARB had done its investigation because I did not want there to be anybody raising any issue that I had spoken to anyone before the ARB conducted its investigation. Johnson: How many people were evacuated from Libya? Clinton: Approximately, 25 to 30. Johnson: Did anybody in the State Department talk to those folks very shortly afterwards? Clinton: There was discussion going on afterwards, but once the investigation started, the FBI spoke to them before we spoke to them, and so other than our people in Tripoli -- which, I think you're talking about Washington, right? Johnson: The point I'm making is, a very simple phone call to these individuals, I think, would've ascertained immediately that there was no protest prior to this. This attack started at 9:40 p.m. Benghazi time and it was an assault. I appreciate the fact that you called it an assault. But I'm going back to then-Ambassador [Susan] Rice five days later going on the Sunday shows and, what I would say, is purposefully misleading the American public. Why wasn't that known? And again, I appreciate the fact that the transparency of this hearing, but why weren't we transparent to that point in time? Johnson: But, Madame Secretary, do you disagree with me that a simple phone call to those evacuees to determine what happened wouldn't have ascertained immediately that there was no protest? That was a piece of information that could have been easily, easily obtained? Johnson: I realize that's a good excuse. Johnson: No, again, we were misled that there were supposedly protests and that something sprang out of that -- an assault sprang out of that -- and that was easily ascertained that that was not the fact, and the American people could have known that within days and they didn't know that. Clinton: With all due respect, the fact is we had four dead Americans. Was it because of a protest or was it because of guys out for a walk one night who decided that they'd they go kill some Americans? What difference at this point does it make? It is our job to figure out what happened and do everything we can to prevent it from ever happening again, Senator. Now, honestly, I will do my best to answer your questions about this, but the fact is that people were trying in real time to get to the best information. The IC has a process, I understand, going with the other committees to explain how these talking points came out. But you know, to be clear, it is, from my perspective, less important today looking backwards as to why these militants decided they did it than to find them and bring them to justice, and then maybe we'll figure out what was going on in the meantime. Notice she said "at this point." In other words, we can do analysis later about whether it was a video sparking outrage or a planned attack by terrorists. And let's not forget she did say "we have no doubt they were terrorists." The priority was to understand what happened and to make sure this kind of tragedy could be prevented in the future. You will hear the phrase "what difference does it make" until it's coming out of your ears. And you will hear it with no context by those playing a devilish political game to try to prevent Democrats from retaining the White House.